Lesser spotted catsharks make great photo subjects. Generally speaking, if you swim up to one it will do absolutely nothing. That sure makes a change from your average shark encounter that lasts just long enough to compose a shot before the subject disappears at lightning speed. I’m convinced that most sharks have actually figured out how long it takes to take a photograph and that they delight in winding up the paparazzi. That’s why I love these catsharks. Their idea of a defensive action is to sit in an exposed spot and wait to see if they get eaten or not. Armed with this information I splashed into the frigid waters of Porthkerris in Cornwall looking for perfectly posed sharks. It took a while to track down my first one but finally out of the gloom a sharky shape materialized on the sand. My first reaction was “Gee, that’s one tiny shark!” I had spent the last few days swimming with Basking sharks and faced with this foot long docile little fish it was hard to believe that they were related. Next I considered the problems of what I wanted to do. I only had my wide angle “shark lens” with me so I would have to get within about an inch of this guy before he would fill the frame. I settled down on the sand and started edging closer. At around one meter from the shark it took off in a cloud of sand and left me wondering if this was going to be a new version of the game ‘lets frustrate the photographer’. I finned along and located another catshark. This one was a little more cooperative and I got to fire off a couple of frames before it headed for the hills – I was making progress. The rest of the dive was shark free and I headed back to the beach to rethink my strategy. 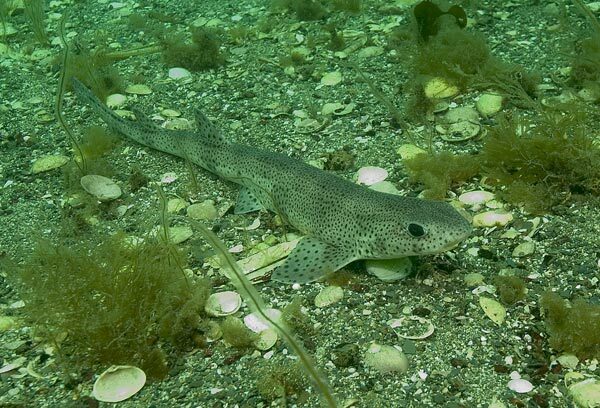 I sat talking to one of the Porthkerris Scuba Instructors who told me about all the catshark pairs that had been there last week performing mating displays for the camera. Apparently during their nuptials they were so oblivious to the divers around them that they could even be picked up and handled without swimming away – figures. I decided to give up on the catsharks for now, and go skate hunting in a sandy estuary close by. Mike Anselmi (owner of Porthkerris Diving) arranged a boat for me and I spent the afternoon drifting up stream with the incoming tide in about 30 ft of water. Visibility was better than I expected and I was able to cover a huge area of muddy bottom but didn’t find any skates. There were a couple of catsharks skulking in the mud and I snapped away furiously before scaring them off. I was beginning to shiver uncontrollably in the cold British water and thinking that Mike must be getting worried by now, I decided to surface. As I began to rise I drifted over a kite shaped object on the ground and my brain slowly came out of its hypothermia induced fog. Kicking back down to the river bed I came face to face with a prickly looking Thornback ray. Thornbacks are actually skates and I was delighted to come across this individual way later in the year than you would expect to encounter one. There was a large dead cod nearby and on its far side a catshark was zealously guarding its decaying remains. I guessed that both of these elasmobranches had delayed their departure until this unexpected feast was over and in their desire to continue feeding they were not prepared to budge at my intrusion. I looked at my air gauge. Hmm, I don’t suppose the PADI police would like this but it’s only thirty feet, right? If I run out completely I’m sure I’ll make it to the surface. I headed first for the catshark who let me get really close with my wide angle lens resulting in some rather eye warping images. The little shark still didn’t fill the frame but content with my efforts I slowly idled towards the Thornback ray. The closer I got the more beautiful I realized its markings were. Its tawny hide was peppered with an ornate pattern of symmetrical white spots, ringed in black. I kneeled on the sand in front of it and marveled at their intricacy. It appeared to be a female lacking the telltale male claspers that extend from the trailing edges of its pelvic fins. A row of well defined thorns ran down the length of her back to the tip of her banded tail. I crept towards her sensitive snout and sluggishly she pushed up on her greatly enlarged pectoral fins and banked to one side, coming to a stop a short distance away. I looked at my empty gauge again. Now, it’s worth pointing out that I don’t live in the UK and didn’t know if I’d ever see a Thornback again. So, giving her a wide berth I circled around to her head and came in for another look. She again took flight and I followed casually, slowly closing the gap between us in as non-threatening a way as possible. It was great to be swimming along with a new species. Becoming accustomed to my presence she finally let me swim directly above her as she arced around and headed back towards her dinner. We had almost returned to where the catshark stood on guard when I felt the resistance building in my regulator. “Ok, I guess its time to leave” I thought. I relaxed and let the increasing buoyancy in my drysuit pull me upwards and as I reached ten feet I was able to breathe in once more. Looking back at the silhouette of the skate against the sand I listened for river traffic and hearing none, I surfaced and looked around for my ride. Mike found me after about ten minutes. He had been looking far and wide and had already asked the local fishermen to keep an eye out for me. Finding out that I had seen both of the elasmos I was after, he beamed in his usual relaxed manner and took us back to Porthkerris.